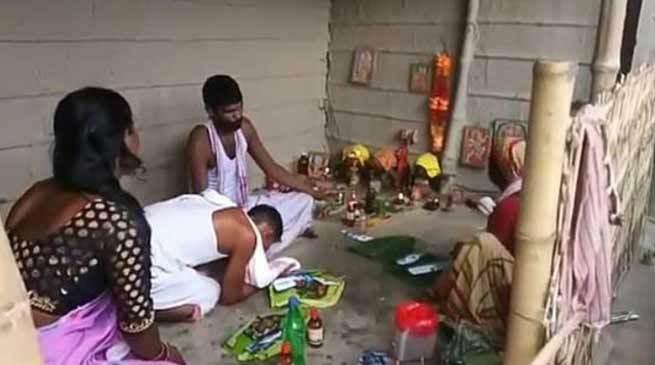 The Assam police on Thursday arrested a self-styled godman from Assam's Morigaon district who claims to have blessed of 'Lord Vishnu' to resolve the problem of the women's' personal and physical life by his “chamatkari chumban” meaning miraculous kiss. The baba Ram Prakash Chauhan was held from the remote village of central Assam's Morigaon district. The godman had also set-up a temple outside his house, as he had became popular in the area within a few weeks time as a magical healer. According to cops, the baba was attracting crowds since last three months in his village Bhoraltup by claiming to have supernatural powers to solve physical and psychological problems of women, including marital discord. “We arrested him after receiving complaints that he was hugging and kissing women in the name of therapy,” said officer-in-charge of the Morigaon police station. The police also arrested his mother for her involvement in spreading the news of her son’s “powers”. She had spread her son has therapeutic powers “acquired from Lord Vishnu” transmitted through kisses on any woman seeking a cure. He was exploiting his devotees, especially women,” J. Bora, head of the Morigaon police that arrested Chauhan, said. However, a cop came to know about the incident more after few local TV channels flashed the video of Chauhan kissing women. It is significant that magical healers are synonymous with Morigaon district, where the literacy is lower than in most of the other 32 districts of Assam.